EMC News - Kiwanis Club of Perth On Tay is a chapter of Kiwanis International, a global organization whose motto is "Serving the Children of the World." 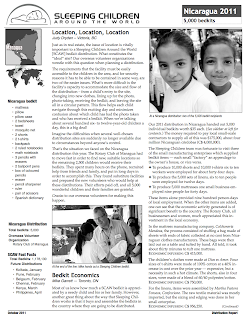 We participate in international Kiwanis projects such as "Eliminate," to strike out tetanus in Africa, and in the Eastern Canada and Caribbean District project to inoculate HIV-positive pregnant women so their babies will be born without the disease, plus the Guatemala Stove Project, and bed kits for sleeping children around the world. We conduct the Kiwanis Terrific Kids program in 12 area elementary schools, to promote good citizenships and help counter bullying. We support The Perth and the Lanark Youth Groups, Air Cadets, the Snowsuit Fund, Kid Fish, Perth Library Summer Reading Program, the Food Bank, Interval House, and the GWM Hospital Foundation. In spring we clean up around an area dump for Kiwanis One Day. We run field games for children on Canada Day at Conlon Farm free of charge, with many prizes. At Christmas we attend kettles for Salvation Army. We fund scholarships for area high school grads, we deliver Meals on Wheels and we distribute free copies of a children's book. To fundraise we collect used wine bottles, pop and beer cans, and run barbecues at the Festival of the Maples and Barnabe's Independent Grocer. We sell tickets to dinner and a play for Kiwanis Night at the Classic Theatre Festival. We sell cakes, truffles, fudge and shortbread at Christmas, and sell YIG grocery cards year round. As well on occasion we hold ad hoc fundraising events. In short, we help the community, children and youth in particular. In order to do so we raise funds, make friends and have fun at the same time. We welcome new members and enquiries. Our new model is Kiwanis 123: Attend one meeting per month, give two hours of service, have three hours of fellowship. See perthkiwanis.byethehost4.com for details or call 613-267-4662. Submitted by Helen Gamble, president, Kiwanis Club of Perth On Tay. As published in the Valley Leader, October 26, 2011. 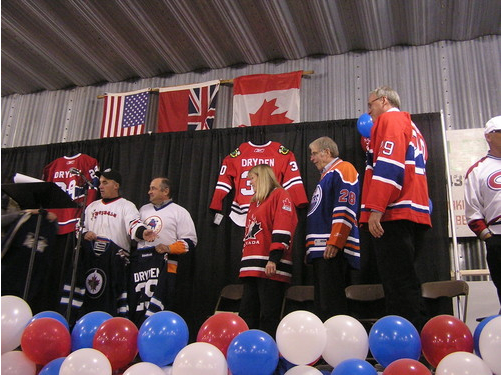 (Photo by Glen Hallick) Judy, Dave, and Ken Dryden received Winnipeg Jets jerseys as a thank you from the community for visiting Domain on Oct. 14, bringing with them the Stanley Cup. And thanks to a charity started by their parents, impoverished children have been helped in the Third World. Thanks to a charity started by the parents of Dave, Ken and Judy Dryden more than 40 years ago children in impoverished countries have received a bed to sleep on. Shortly before coming to Domain the sister of the two goaltending greats returned from Nicaragua on the behalf of Sleeping Children Around the World. 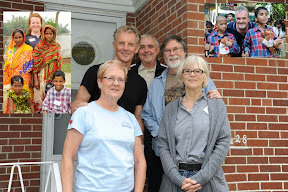 Dave explained the charity was started in the family home in Etobicoke, Ontario. "The whole idea was to give bedding, clothing, school supplies and mosquito nets to kids in Third World countries," the former NHL and WHA goalie said. He said about 1.2 million children have benefited from SCAW. "Each year we end up doing 71,000 bed kits," he said. Being a volunteer organization SCAW had no overhead and is able to devote 100 per cent of the donations to the bed kits. Since its inception over $23 million has been raised. Some of the 33 countries where children have been assisted include Tanzania, Kenya, Togo, Zimbabwe, Nicaragua, Honduras, India, Bangladesh, and the Philippines. On Oct. 14 the Drydens were in Domain with the Stanley Cup because it's the hometown of their late father Murray. As published in The Peterborough Examiner, October 26, 2011. The Rotary Club of Peterborough awarded Paul Harris fellows Monday to Ann McIlmoyle, Erica Cherney, Bill Lockington, John Mackle, Jill Adams and John Bruce. The fellow, established in 1957, recognizes people who contribute, or who have contributions made in their name, of US$1,000 to The Rotary Foundation of Rotary International. McIlmoyle, a retired teacher, won the vocational service award for her association with teacher education at Trent University, the University of Waterloo, Dalhousie University and Lakehead University. Erica Cherney and Bill Lockington both won the Community Service Award. Cherney, a local businesswoman, volunteered with the United Way of Peterborough and District for seven years in a number of roles including as president. Cherney also sat on the board of Trent University for nine years including four years as chairwoman. Cherney was also chairwoman of the Peterborough Downtown Business Improvement Area and has volunteered for the Peterborough Symphony, Peterborough Theatre Guild, Peterborough Regional Health Centre, Fleming College, Beth Israel Synagogue and the Trillium Foundation. Lockington is a founding and past chairman/director of the Greater Peterborough Area Economic Development Corporation. the Peterborough Collegiate Foundation. He also served the YWCA's Crossroads Safe Haven Campaign, St. Joseph's Health Centre, the Festival of Trees and Showplace Peterborough. Most recently, Lockington has helped establish the Community Foundation of Greater Peterborough. He is currently chairman and director of the Greater Peterborough Innovation Cluster. John Mackle, the former education director of the Peterborough Victoria Northumberland and Clarington Catholic District School Board, won the Community Service and Vocational Award. He has been co-chairman of the United Way of Peterborough and District campaign. He was unable to attend Monday's ceremony and will receive his award later. Jill Adams, a retired nurse, won the International Service Award. Adams has been on a series of overseas missions including four months at an orphanage in Mexico; she is also an active fundraiser for Sleeping Children Around the World. Teacher John Bruce won the New Generations Service Award. Bruce has taught around the world including in Peterborough and has volunteered coaching varsity hockey at the high school level. He has also volunteered for Jamaican Self-Help during his summer teaching breaks. Photos are available in the Nicaragua 2011 Photo Album. You can view them by clicking the link above. As published in the Stratford Beacon Herald, October 19, 2011. Volunteering to help some of the poorest people on the planet inspires a variety of feelings: hope, humility, pride and perspective. Stratford's Doug MacDougald will travel to Bangladesh this week to distribute bed kits for the organization Sleeping Children Around the World and, when that works is done, he'll stay a little longer to attend the wedding of a fellow Canadian volunteer to a Bangladeshi Rotarian closely involved with the charity effort. "Who knows where and when romance will happen," said MacDougald as he prepared for the trip to the impoverished South Asian country. When he arrives, MacDougald will lead a six-member Canadian team in the two-week distribution of 6,000 bed kits containing a ground sheet, pillow, blanket, mosquito net, clothes and school supplies. The kits are central to the organization's belief that every child, no matter how poor, deserves a good night's sleep. "It's a wonderful charity," said MacDougald, who, like other "volunteer travellers" with Sleeping Children Around the World, will pay his own travel expenses to participate in the distribution. "It is a very direct assistance for poor children." Team members will visit some of the most impoverished villages in the northwest, northeast and southwest corners of Bangladesh to hand deliver the bed kits, with the help of the Rotary Club of Dhaka. This is MacDougald's fifth trip with Sleeping Children Around the World and his fourth to Bangladesh. It's often hot and humid, and villages in Bangladesh lack many of the comforts and amenities of the Western world, but Mac- Dougald has no reservations about going back. "It's my annual readjustment of priorities," he said. Handing out the much-needed supplies is a moving experience, noted MacDougald. "When you're actually up close and hands-on, it really sinks in emotionally," he said. Anyone can make a donation to help cover the cost of the $35 bed kits, distributed in developing countries. Sleeping Children is a "100% charity," meaning every penny of donations is spent on bed kits and not on administration or operating costs, noted MacDougald. As published in the Winnipeg Sun, October 14, 2011. Two former NHL stars are bringing the Stanley Cup to Manitoba Friday in honour of their father's birthplace. Ken Dryden, the legendary goalie who won the cup with the Montreal Canadiens six times during their 1970s dynasty era, as well as his brother Dave, himself a former NHL goalie, are bringing the cup to Domain, Man., Friday. Their father Murray was born and raised near Domain, a village located about 35 km south of Winnipeg, and Ken and Dave Dryden's cousins still farm the family property there. 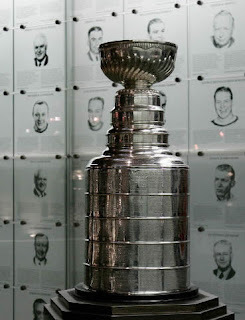 The Hockey Hall of Fame allowed the Drydens to take the cup after Ken successfully lobbied the organization to allow former cup-winning players to tour it, much like the current champions do during the summer. "That wasn't a tradition when I was playing, and it's such a great thing to do," Ken said. "It makes you think 'where would I go and who would I share it with?' There were fantasy places in my mind, but that's all they were going to be." So he approached the Hockey Hall of Fame, and they eventually agreed. One of the places he thought of was Domain. "We heard all about Domain throughout our childhood and I've been there a few times," Ken said. "Some places are so small it's very unlikely someone's going to grow up there, play in the NHL and be on a teams that wins, so this is a way to get the cup there." The Drydens said it is "an unbelievable coincidence" that they're taking the cup to Domain on what would have been their father Murray's 100th birthday. Murray, himself an Order of Canada recipient for his charity work, died in 2004. On Saturday, the Drydens will take the cup to their own childhood home in the Toronto suburb of Etobicoke. The home, which is now the headquarters of Sleeping Children Around the World, the charity founded by Murray Dryden and his wife Margaret, was often home to neighbourhood hockey games when Ken and Dave were boys. A reunion game is planned for Saturday, which will also see the cup travel to the local arena where Ken played community-level hockey for Humber Valley. SCAW's 2012 Calendar is now available on our website. To order on-line using your credit card, go to Sleeping Children's Secure Pages. You can also download a Donation Form or contact us by mail, phone, or email. We call it a 100% calendar because 100% of the amount you pay for the calendar goes to buy bedkits for children in developing countries. It was printed using proceeds from the 2010 "An Evening with Lynette and Friends" concert. Thanks to Sleeping Children's travelling volunteers who contributed photos and anecdotes. Production thanks to Milton and Lynette. It is a 14-month calendar beginning in November that was designed in collaboration with Sally at Sallart Studios and printed on 100% PCW recycled and recyclable paper in the most environmentally responsible way by Warren's Waterless Printing. 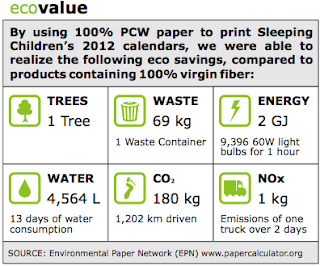 Production methods make it Certified 100% Carbon Neutral. Calendars are $12 each but you can buy 3 for $35, the cost of one bedkit. Remember that 100% of the sales of this calendar provide bedkits for children in developing countries.